Official ceremony at the University of Nevada Reno. Members of Veterans of Foreign Wars Post #3819 tolled ship’s bell in remembrance of the men and ships lost on the 65th anniversary of the attack on Pearl Harbor. The exhibit of the US Fleet 1941 Recreation Project was held for two days. 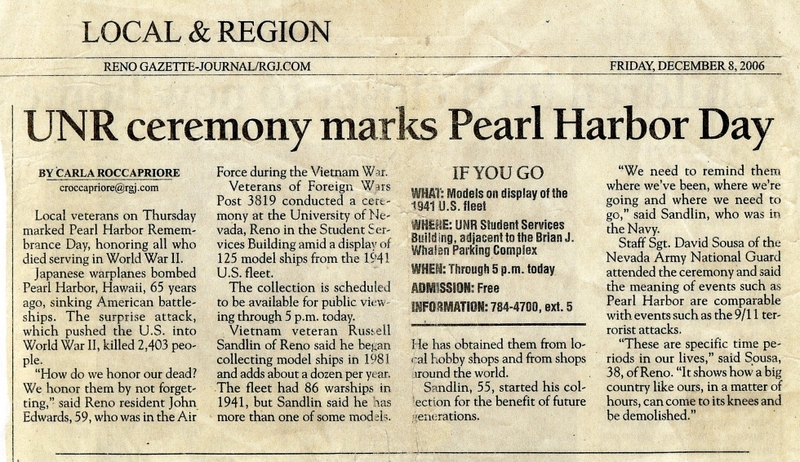 Joe Hart, anchorman, for channel 4 NBC reported the story on local news broadcast, before the NBC national broadcast of the Remembrance Ceremony at the Pearl Harbor Visitors Center in Hawaii. Brian Williams anchored the news broadcast, and Tom Brocaw covered the ceremony. The Reno Gazette Journal newspaper covered the local event in Reno, Nevada.